It is difficult for the battered and bruised Indian team, low in moral to prepare for the final Test. When mentally down, it is hard to prepare and there is hardly anything in the bench strength and likely India might go with not much changed side again. The English expert, our coach Duncan Fletcher seemingly is not delivering and not brining any thought-process too. At sunny Surrey, it is reported that Indian players had a lengthy net session only their `commander-in-chief' was conspicuous by his absence. The news filtering through the Indian camp is that Dhoni simply chose to exercise his right to skip optional practice in order to get some additional rest ~ and but for wounded pride, there is no reason to believe that Dhoni is carrying any injury. Dhoni apart, there were no surprises in the net session that lasted well over three hours. It was the same old routine, practised by the same old faces with the same old approach. Ashwin was the first man to bat in the nets ! Ishant is expected to be back replacing Pankaj. Will the management have the gumption to rest Virat Kohli, drop Jadeja ? – despite not so convincing show, Gautam Gambhir is set to get another shot at redemption. There have been circumstances where teams have played football (and some player got hurt too) ... here fielding coach Trevor Penney introduced a new element to the curriculum !! – he involved the players in a game where they had to pass a tennis ball on one bounce to a teammate. And the losers of the game that resembled handball, had to line up side-by-side, like footballers arrange themselves in a `wall' to defend a free-kick. ........ was that any exercise in brining physical fitness, orienting them mentally or simply mockery !!! Kennington is a district situated in Central London, England, south of the River Thames. Proximity to central London was key to the development of the area as a residential suburb and it was incorporated into the metropolitan area of London in 1855. Kennington is the location of several significant London landmarks: the Oval cricket ground, the Imperial War Museum and Kennington Park. In 1844, Kennington Oval was a market garden. The Oval was then (and still is) owned by the Duchy of Cornwall. The Duchy of Cornwall is one of two royal duchies in England, the other being the Duchy of Lancaster. The eldest son of the reigning British monarch inherits the duchy and title of Duke of Cornwall at the time of his birth, or of his parent's succession to the throne. The current duke is Prince Charles, the Prince of Wales. The principal activity of the duchy is the management of its land and properties. The government considers the duchy to be a crown body and therefore exempt from paying corporation tax. The final test is to be played at ‘the Oval’, officially referred to as the Kia Oval due to commercial sponsorship, situate at Kennington, in the London Borough of Lambeth, South London. The Oval has been the home ground of Surrey County Cricket Club since it was built in 1845. It was the first ground in England to host international Test cricket, in September 1880. The final Test match of the English season is traditionally played there. In addition to cricket, it has hosted many other important sporting occasions and can lay claim to being the most historically important general sports ground in the world. It staged the first FA Cup final in 1872. Indian moment of glory came at Oval in 1971 – on that tour when Indian spinners – Bedi, Venkat & Chandra excelled claiming 37 wickets – it was Bhagwath Chandrasekhar – whose eight wickets brought India their biggest win to date. Year later, in the final Test of 1979 Series, Sunil Gavaskar played a classic knock in the 4th innings. Chasing a mammoth total of 438 runs in the fourth innings, he set the The Oval stadium on fire with a masterly knock of 221 runs. On that tour, Indians were beaten comprehensively in the first test by an Innings & 83 runs at Headingly and the 2nd & 3rd Tests were drawn. Srinivasan Venkatraghavan and Mike Brearly were the captains. In the 4th Chetan Chauhan and Sunil Gavaskar were involved in a grand partnership of 213 and then Dilip Vengsarkar added another 153 – thus Indians were 366-1 at one stage, which for sure created jitters. At tea, India was in a commanding position at 304 and England played negative tactics in slowing down the game. When mandatory overs began, India required only 100 runs and were on course to a historic win. Not to be, as in the end, India sort of throw away the match, with couple of poor decisions hastening the end. Eventually India fell short by 9 runs with 2 wickets in hand losing the series 1-0. Bharat Reddy was the wicketkeeper then. Sadly, Venkat was to lose the Captaincy in an ignominy – reportedly the news was broken in the PA system of the aeroplane when the team was travelling back, Gavaskar became the Captain. Oval’s controversy was in 2006 when England were awarded a Test against Pakistan. 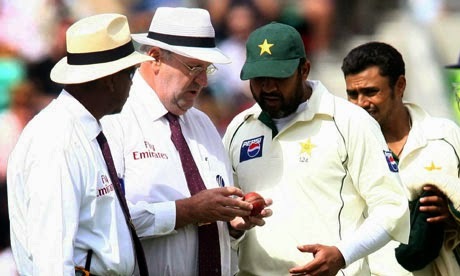 Darrel Hair awarded England 5 penalty runs for ball tampering by Pakistanis; Inzamam-ul-Haq refused to lead his side back on to the pitch after tea – the initially was called as a forfeit in England's favour. ICC amended that decision in July 2008, declaring the result as a draw. A year later, that ruling was overturned in the ICC board meeting in Perth, which awarded the match to England. With regards – S. Sampathkumar. 14th Aug 2014.